The audience was addressed by Zvonko Kusić, F.C.A, President of Croatian Academy of Sciences and Art, professor Damir Boras, Ph.D., Rector of the University of Zagreb and professor Ružica Beljo Lučić, Ph.D., Assistant to the Minister of Science, Education and Sports. All of the speakers welcomed and expressed content with the steps made to develop national academic infrastructure for a reliable storage of digital property and to facilitate open access. 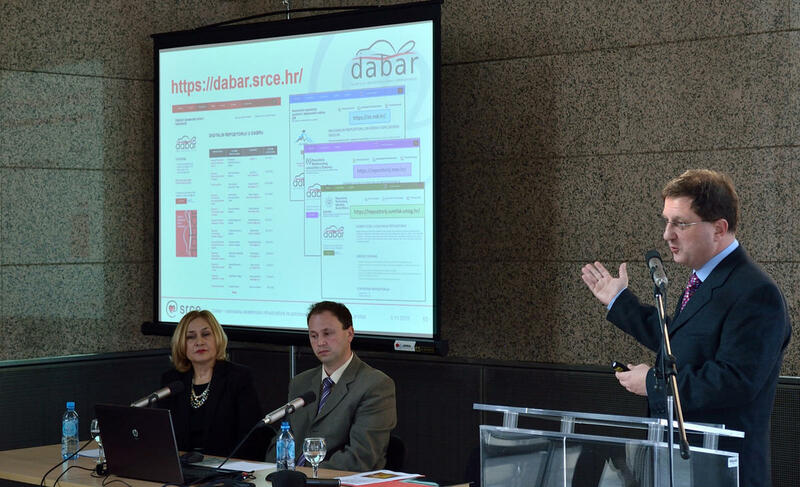 In his presentation, Zoran Bekić, Ph.D, Director and CEO of SRCE, stressed the importance of data management and presented SRCE's new important component of the data layer of e-infrastructure in the Republic of Croatia – the DABAR system. DABAR is a system that enables all Croatian higher education and/or research institutions to easily establish digital institutional repositories, as well as store and publish their digital materials. It was pointed out that DABAR was being developed in cooperation with the academic community. The system also facilitates and promotes the principles of open access and represents the achievement of goals in the area of open access infrastructure, set by the Strategy of Education, Science and Technology in Croatia. The Director also reported that 29 institutional repositories had been established since DABAR’s live release, two months ago, and 28 more were currently in process. Tatijana Petrić, Ph.D., Director General of the National and University Library in Zagreb spoke about ZIR, Croatian e-theses repository established at the National and University Library in Zagreb. ZIR is a collection of documents stored in the institutional repositories within DABAR and, as such, it has also been establish within this reliable platform for digital repositories. A short movie, showing scientists, students and librarians talking about scientific ethics, plagiarism and open access, was also shown. The movie is available in Croatian at ZIR's web site where you can also read more on scientific ethics from Croatian scientists and university professors.